The human Paks are a family of six serine/threonine-directed protein kinases identified as effectors of the small GTPases Rac (p21) and Cdc42 (Manser et al. 1994). Pak kinases are divided into two subgroups based on sequence similarity. Group I Paks (Paks 1, 2, and 3) contain an N-terminal autoregulatory domain that is involved in the formation of autoinhibited heterodimers (see below). In contrast, the group II Paks (Paks 4, 5, and 6) do not contain the autoregulatory sequences observed in group I Paks required for autoinhibition, and as such are constitutively active (for a review of group II Paks, see Jaffer and Chernoff 2002). The group I Paks contain a GTPase-binding domain (GBD) that is homologous in both sequence and three-dimensional structure to the GBD of WASP (Kim et al. 2000; Lei et al. 2000). Binding of activated GTPases to group I Paks stimulates Pak autophosphor-ylation as well as phosphorylation of downstream substrates. Group II Paks also bind Rac and Cdc42, but this interaction does not appear to regulate their catalytic activity (Jaffer and Chernoff 2002; Cotteret et al. 2003). Instead, evidence suggests that GTPase binding mediates recruitment of group II Paks to specific subcellular locations (Wu and Frost 2006). 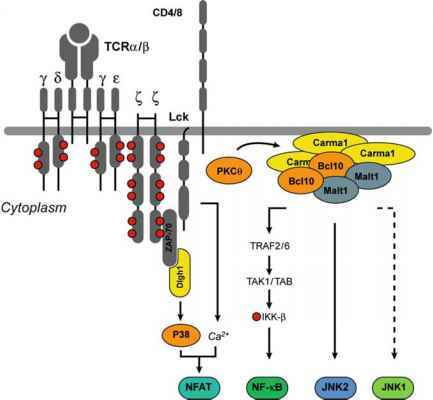 The best-characterized member of the Pak family is Pak1, which has been shown to regulate actin dynamics downstream of Rac and Cdc42, thereby affecting cell morphology, polarity, and cell migration. In addition, Pak1 activity has been linked to the signaling pathways that control cell growth, survival, and cell cycle progression. For an excellent review of group I Pak biology and function, see (Bokoch 2003).